Recently a heated conversation took place on Instagram prompted by SBCC’s recent post on why size inclusivity is not often practiced. The plus-sized community has heard these reasons time and again. Fit models aren’t available, mannequins are more expensive, they can’t get pattern testers (maybe try asking a plus sized community like the Curvy Sewing Collective FB group and not having such a short turn around), they did a survey of existing customers and found out they were within their average range anyway so why expand? The IG post on SBCC’s feed is where much of the debate took place. The basic lean of the post echoes a fatphobic language that somehow our fat bodies are modern day recent inventions that they have to “deal” with. Comments from indie pattern companies without inclusive sizing started thanking SBCC (who btw does have a good size range) on finally creating a post that justifies their choices for not expanding their sizes. The comments further speak to it being difficult for a small business to expand their sizes and I do sympathize. It’s tough out there, but it’s really tough for a beginner fat sewist to start out and encounter zero patterns in their size. Those indie pattern companies include: Closet Case Files, By Hand London, Sew House 7, Paper Theory, Fehr Trade, and others. The point in mentioning them by name is not to be mean (a lot of accusations that we’re being mean by being political going around…. ), but to see where they decide to go with the way that people are reacting to their comments. Will this change the landscape of the home sewing pattern industry? But let’s examine some history first to see what got us here and why Shannon, Mary, and so many others on IG are discussing this complex issue (Megan, Emily/The Catwood, Whitney, Jenny/Cashmerette, Emily, Jacqui and so many more). This article provides a good overview of the history of plus sizes. In short, Lane Bryant was the first company that still exists today to cater to plus sized woman and used the term plus sizes in its advertisements in the 1920s. Plus sizes were gradually moved out of the “standard” or “misses” sizes and provided their own sections in department stores and catalogs over the years. The reputation then became that plus-sized clothing was frumpy and not fashion forward. It’s only recently that the fashion industry has started providing better fashion for plus sizes as a result of the body positivity movement. Several brands, most notably ModCloth, have moved away from providing separate plus sized sections in favour of a more inclusive sizing perspective. There are also some other retailers, like Forever 21 and H&M, who moved their plus section entirely out of their stores. Spoiler alert: that move doesn’t go over well with their customers! An aside, this thesis covers plus sized online shopping motivations. It’s 300 pages and I haven’t gotten through it all yet but it is SUPER fascinating. What the fashion industry is learning is that the plus-sized market is good for your business. I have been plus sized since shortly after puberty. I remember buying unwired bras that looked like post-surgical bandages because that was what was available in my size. I remember shopping in the men’s sections for jeans that actually went up to my size. I remember wearing a whole lot of ugly clothes because nothing else was available. From age 13-16, I wore a uniform of men’s jeans, doc martens or running shoes, oversized men’s shirts and hoodies or flannel shirts or cardigans. Whenever I went shopping for a dress, I honestly cried myself to sleep because my friends would get to wear the gorgeous dresses and I would only be able to choose a floral sack leading to my decades long hatred of floral patterns that I recently got over. I asked my mom to make many things, but being a mom of 4 and working….well, I didn’t ask as much as I wanted to and I didn’t learn how to sew at the time either. At 16 (1996), I started shopping in thrift stores and put together some more eclectic outfits. I loved finding the weirdest vintage cardigans with crystal buttons or something. I still never found dresses but I managed to figure out some fun ways of layering and styling that I didn’t think of before. I should also note that my mental illness factored into how I dressed a lot. I suffered from severe depression from a young age and often tried to hide myself in clothing to not be seen. It wasn’t until I was 25 (2006) that I started exploring plus-sized stores, buying more fashionable things, and living my best life. Of course, as a poor student that kind of meant some credit card debt was acquired…. Eeesh. Around that time, brands were starting to really bloom with plus-sized fashion choices. This expanded through online shopping. I would shop ModCloth a lot and eShakti before I started sewing all of my clothes in 2012 (after learning to sew in 2008). Sewing patterns have existed for a really long time; since about the same time the printing press was invented, sewing patterns having been available in print. The above image is from Juan de Alcega’s Libro de Geometria pratica y trac a para (1580). Early sewing patterns were available in one size only meaning that they had to be adapted to the individual based on measurements. McCall’s (est. 1870) was one of the first pattern companies that provided multiple sizes in their sewing patterns. This article covers a more complete history of sewing patterns. All companies create their own blocks to work from based on proportional measurements. Every company used their own block and there is not specific standard block. This is the same for the fashion industry, which is why you can walk into 10 different stores and have 10 different sizes or not even be represented in half the stores or more. Not much (yes an oversimplification, I know) has changed in how patterns are drafted or graded. (Aside: I would love to be able to read this journal article on Defining and Testing the Assumptions Used in Current Apparel Grading Practice; the summary sounds amazing…I miss having access to academic journals. Edit: I got the article! Another aside, this article is pretty fascinating on creating custom patterns using formula in CAD). Immediately become skeptical of anything “standard.” Before the 1940s, sizes were based on age in younger clothing and bust size for women. In the 1940s, this changed. In 1939, the U.S. Department of Agriculture decided to go to the effort of creating standardized sizes (*again keep your skepticism everyone*). Without a computer, the data of around 15,000 women was collected and analyzed by Ruth O’Brien and William Shelton. And it was biased af, everyone: “Since the survey was done on a volunteer basis, it was largely made up of women of a lower socioeconomic status who needed the participation fee. It was also primarily white women. And the measurements still primarily relied on bust size, assuming women had an hourglass figure”(source). They published the results in this book. The general myth of sizing is that plus sizes are a new problem. I challenge all of you to do some quick research into fat bodies in paintings and sculpture and tell me again that plus sizes are a new problem. The original data that created “standardized sizing” was flawed. It was racist. It was sizeist. It was classist. The authors get into weight and their median weight at page 48. Their average weight was 135 with 160 at the higher range. A lot of people take this data for pure factual analysis that there weren’t a lot of fat bodies back then. Somehow fat is a “modern day problem.” First off, fat isn’t a problem. It’s something that each and every body has and will have until the end of animal history. Fat has some pretty wicked positives of helping cushion your joints, keeping you warm without fur, and many other things that are just being discovered through research. Second, we don’t have a lot of data that gets into average body sizes before 1939 or quite frankly after… Data has only existed on sizing since that study and not much has been done since. There has been more research emerging recently (thanks in part to body positivity movement), but it has yet to impact how patterns are drafted. 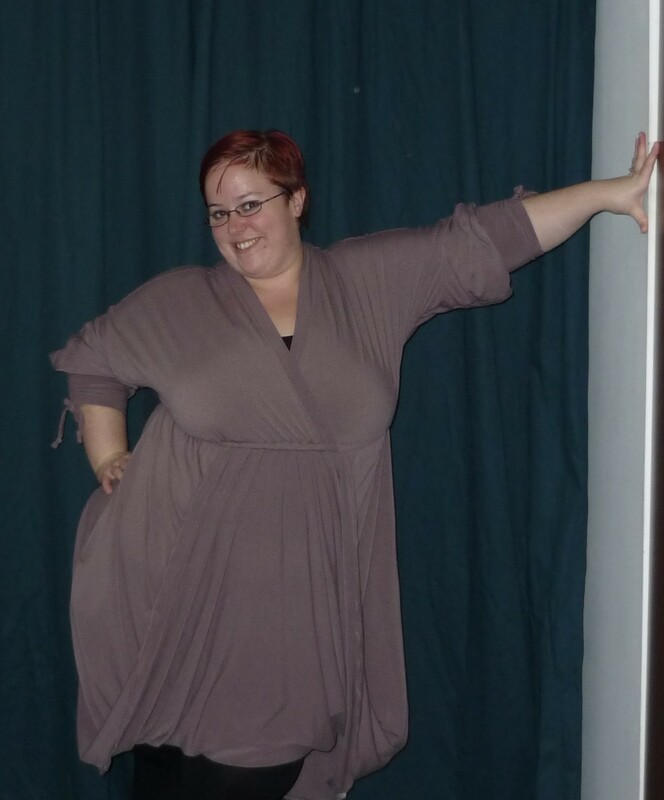 There isn’t a lot of resources on the history of plus-size patterns. I know only from anecdotal conversations with sewists who have been sewing and are plus sized as well as the anecdotal comments of vintage pattern sewists who are plus sized. On the topic of vintage patterns, they are very difficult to find. However, whether this is because there were lower numbers produced or plus-sized sewists used their patterns and kept them until they wore out is a question for the no-history books on this topic. We know that plus-sized bodies existed but there are very few mentions of how to tailor patterns to a larger size in the earlier books on garment making (that being said, I haven’t done exhaustive research on this topic; I do find it fascinating though so if anyone wants to pay me to research this stuff, I will do it!). We do know that Lane Byrant was the first company to use plus sizes in their advertisements, but we don’t know whether people cared about it before. We know fatphobia existed, though. Fat jokes go back centuries everyone. Anecdotal information from plus-sized sewists who have been sewing for years is pretty similar to my experience starting to sew 10 years ago (plus a few months): the plus-sized patterns were frumpy and not fashion forward in major pattern companies. Now the correlation of home sewing patterns to the fashion industry is very important here. Home sewing patterns tend to borrow from existing trends in the fashion industry for designs. For the most part (another heavy-handed generalization, I know), home sewing patterns lag behind the trends in the fashion industry rather than leading the trends. This lag . . . I can’t explain why it exists (likely lots of complex reasons about why home sewists sew and business reasons, etc), but the fashion industry leads the home sewing industry which is why I provided a short history of the plus-sized fashion industry earlier. So, if the fashion industry didn’t use the term “plus sizes” before Lane Bryant… then likely… home sewing patterns didn’t either. I mean I’m generalizing again here but one can probably say that there wasn’t really a concept of plus-sized patterns. “Stout” is a term that exists before. I would definitely need to do more extensive research to give you more information (pay me! haha). There have been many pattern companies that have sold and continue to sell plus-sized patterns for years now. All of the major (umbrella) brands provide some type of plus-sized patterns: McCall’s and Butterick have “plus-sized” sections on their patterns, Burda magazine (and subsequently their online patterns) have a plus-sized section (usually offering around 5-6 patterns a month in the 44-52 range), Simplicity has a plus-sized section, etc. Other sewing magazines tend to reach up to a size 52 or 54 for some, if not all of their patterns. In the indie sewing world, certain brands have existed for a while with plus-sized offerings. We try to keep a comprehensive list of plus sized pattern companies at the Curvy Sewing Collective, so please check that out for a larger list. With the body positivity movement, home sewing has actually changed a lot (thankfully!). When I first started sewing, my measurements were smaller than now. I don’t remember them exactly but they were around 44-40-48 and now they are at 52-48-56. With my smaller measurements starting out, I was outside the range for a lot of patterns and am even more so now. I learned quickly about BMV’s famous ease and found that with some adjustments I could actually fit into their patterns. I choose my size based on my upper bust measurement and learned how to do an FBA around 2012 from some other amazing sewists that ending up forming the Curvy Sewing Collective. Colette Patterns (a company who I was very into at the time since I was always into vintage looks) then expanded their sizing and the CSC was born with Tanya, Mary, and Jenny still being the original founding members. I’ve been there cheering on the CSC ever since then and am now an editor. Yay! Since the success (albeit mixed….hrm) of Colette’s plus sized expansion, a lot of other indie pattern companies have emerged that cater to a more inclusive sizing either from their creation or from the overall success in the rest of the community and continuing demand for it. I’d love to, in general, know more about the plus-sized home sewing market and what percentage it is of the home sewing market. I would also love if there were a more wide (har) survey done on the customer base. The CSC survey Jenny did years ago is currently the only one I know (does admittedly have it’s own biases since it samples CSC readers who are well, probably, plus sized). What does this have to do with fatphobia? Since standardized sizing was created through a biased sample size, the fashion industry has used that as a standard in pattern drafting and since home sewing patterns follow the fashion industry….well the cycle continues. Standardized sizing excludes fat people. The sample size didn’t have enough data and everyone sort of agreed that is okay and moved through history with a biased point of view. Fashion advice emerges for larger sizes based on some expectations to look more slim and hide their fat. The very fact that a pattern company chooses to start with standard sizes usually stems from that need to conform to the norm in our society; in the 1940s it was the hourglass figure and then later it became a body with less and less curves creating a fatphobic norm. Somehow (it’s mysterious! *sarcasm*) because fat people weren’t part of that initial sampling, we are a modern day “problem” for pattern drafting. It’s probably not an active choice for exclusion but it is an active choice to go with the norm. Examine why you chose your size range and be transparent about it. Share it in your about page. If you want to expand your sizes, you don’t need to do it immediately. Try releasing an action plan or business plan or vision for the future. You can do it as slowly as you need to. If you don’t want to expand your sizes, say that you have no plans and then support plus-sized pattern companies by linking to them. You can do that through FAQs to bury the recommendation if you really want…. We aren’t your target market so do us a solid and direct us to people who want our business. Share your size chart and include more measurements (bicep, etc). Some of us will go through the trouble of making adjustments with more information available. Listen to your customers and your potential customers. And, for goodness sake, if you choose to rely on a survey to understand that the plus sized sewing industry is huge (just like the plus sized fashion industry) at least share it in groups that target different demographics from your existing customer base. You will never have a good sample size unless you seek outside of your bubble. Let’s not repeat age-old mistakes here, okay? Share your fat makers! I care if an IG feed or a blog is filled with white skinny young middle class cis straight abled people. I want to see BIPOC, queer (like me! ), fat (like me! ), old, disabled (like me!) people too! I want to see everyone and everything. I know that lots of people like curated feeds (UGH) so be transparent about what colours for backgrounds and fabric you prefer, quality of photography, backdrops. Let me know because there are so few pattern companies that share makes by a large variety of people. Share samples on bodies in a range of sizes for your patterns and remember to share your largest size! Shout out to pattern companies that have inclusive sizing. Shout out to pattern companies that took this discussion and already acted on it. Shout out ESPECIALLY to pattern companies that have a size chart beyond 60 inches. It’s still a really rare thing to see. Feel free to buy me a ko-fi. I’m pleased with the result. In the middle of summer, I would probably see the dress as frumpy and shapeless and find the draping really odd, but in the middle of our Canadian fall with the doom-stricken Game of Thrones-like “Winter is Coming” on the horizon, I am loving the comfort of the dress. It’s like wearing a sweatshirt and still looking stylish with all that draping and the cuff details. Sorry for the indoor photos. All it does it rain rain rain and when it doesn’t rain, I am too busy to take pictures so I sucked it up and took pictures in the house. I finished this up last week and figured I should get on posting it. I had quite the time with the pattern instructions. You can read about some issues with Burda patterns in CSC’s burda sewing tour wrap-up post. Basically, to sum up, the pattern pieces are marked with numbers and don’t also have what they are written on them (ie. front bodice, back skirt, etc.). A lot of the direction isn’t written on the pattern pieces either. The instructions are also all in text and the instructions for this dress specifically were missing steps. Burda magazine patterns can be challenging and are definitely not for beginners. One of my first dresses was a burda dress, in fact, but the Kristen dress actually had really nicely detailed instructions, if the pattern itself ran extremely large. Start off by reading through the instructions really well and then read through them again and again and go slowly to make sure you get them. For the instructions, there were missing steps and not clear steps. Missing was the step to sew the back bodice together. I get that is practical knowledge, but it’s not there at all and that is a huge oversight. Unclear was the draping at the front. Basically, the front skirt is one large piece, where you take the bottom and then fold it in half and pleat and baste the bottom into the waistline, essentially making the fold line the hem. The pattern really stumped me in how that was worded and I ripped the thing out three times before I got the pleating and the folding right. There is also pleating in the centre back, which to be honest made very little design sense to me. I did it, but I think the pleating adds unnecessary bulk to the waistline where it can easily be gathered more. The other part that was unclear was the waistband construction. I chose to use the instructions from Colette’s Myrtle dress instead, except that I fed the elastic into the channel, which was reallllly difficult with all the pleats and fabric bulk in the channel. Anyway, I did it and it came out lovely. The last bit that I just chucked out the window was the waistband ties. The placement of the faux ties didn’t work out for me and so I didn’t add them. I also didn’t do flat felled seams, because again it added a lot of bulk. I used a lightweight jersey, but maybe not light enough for this pattern and all that fabric! Fitting for this pattern runs super large. I cut a size 52 and added the seam allowances. I am probably more in line with a size 54 + FBA with Burda, but I figured the stretch in the material would make that a non-issue, but I could have cut out a 52 without adding the seam allowance and still had the dress be roomy. If you decide to try this pattern out and don’t size down, I definitely recommend sizing down for the cuffs, because they are humongous and by the end of the day are stretched out and falling down. Do yourself a favour and cut two sizes smaller for the cuffs, because ripping out all of the drawstring channels and drawstrings to size down the cuffs is not something I am willing to do. I do recommend grading up to the larger size for the kimono sleeves, though, if you have bigger arms like me. Mine are fine, but not as puffy as the pattern picture. I followed Jen’s instructions in the wrapalong for the neckline. Partially because the instructions rock and also because the pattern pieces for the neckline in this pattern are cut into three pieces: left side, neck curve, right side. I tried going with burda’s pattern pieces and then ripped out the whole thing and drafted my own piece. The neck curve ends up being stupid. It bunches and doesn’t sit right and is just stupid. STUPID. One long continuous band is much much smarter. Draft it slightly shorter than the length of the neck and right and left sides and stretch it a little as you sew. I should have made it shorter and stretched, because it is a faux wrap, but I didn’t. It’s fine, but by the end of the day the neckline stretches out a bit even though my fabric has good recovery and becomes slightly revealing. Hence, the camisole underneath for work. So, I recommend making it two inches shorter and then stretching to fit the bodice and neck. Gillian over at Crafting a Rainbow has an excellent guide on where to stretch for a faux wrap dress neckband. Start by sewing the back together, because the pattern doesn’t mention it! I actually, in spite of all of that, enjoyed sewing this up and love wearing it. 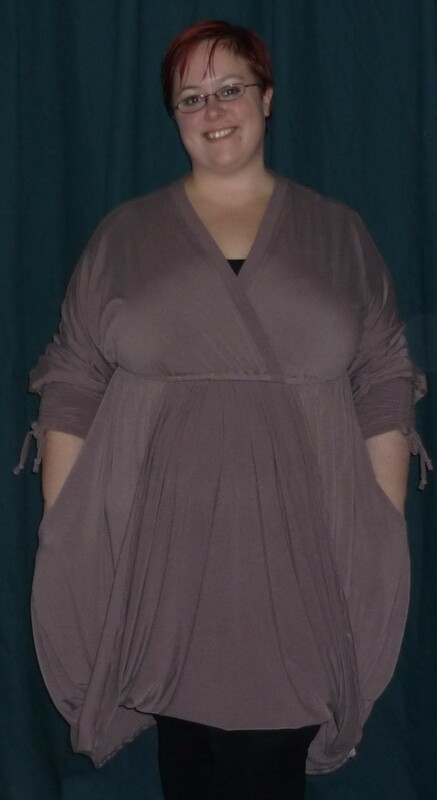 It’s a super comfy faux wrap dress and perfect for the impending Canadian winter.